If you’ve considered (or already bought) marketing automation software, then you’ve no doubt heard about its powerful capabilities to generate new leads, nurture prospects, and ultimately convert those leads into paying customers (and thus revenue) for your B2B company. But with all the talk of lead-to-revenue performance, you may have walked away with the impression that marketing automation is just a sales and marketing tool – not for customer service. That’s where you’d be mistaken. 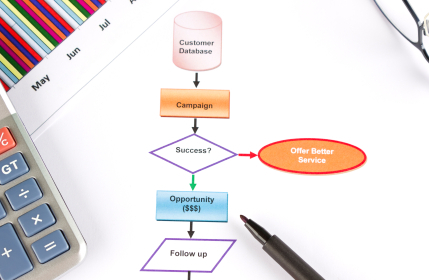 While there certainly is plenty of potential for new lead capture and nurturing prospects through these platforms, there’s also a number of ways that you can use a marketing automation system to nurture your existing B2B customers. What makes a great customer for your business? Do they sing your praises on Twitter or Facebook? Do they login to your website on a daily basis? Are they consistently trying out your latest and greatest products or services? Just as you can create a lead scoring model with marketing automation, you can also create a customer scoring model by tracking these key loyalty actions. For each Tweet in which a customer mentions you, award them some points in your scoring model. For each visit to your website or blog, award a few more. By measuring these loyalty-indicating behaviors over time, you’ll not only be able to easily identify your most valuable customers, but you’ll eventually be able to associate those loyalty actions with the amount of revenue they each generate. For example, say for each customer that Tweets about your company, the lifetime customer value of that particular account is 25% greater than average. Wouldn’t that data be nice to know? Marketing automation can get you there. We all know that we should ask customers for feedback as soon as they buy, because their impression is still fresh and they still have a vested interest in communicating with your company. But in practice, this doesn’t always happen. Many marketing departments get so caught up in the task of bringing in new leads, any initiatives that help them retain customers and gather valuable customer feedback fall by the wayside. Fortunately, with marketing automation software, you can set up net promoter score emails, buyer surveys, or requests for ratings and reviews, and then automate these messages to send within days (or even minutes) of a prospect becoming a new customer. Sure, it takes some time to set these up at the start, but once you’ve put in that initial investment, you’ll start getting timely customer feedback automatically. Then you can use that feedback to guide your future sales and marketing initiatives to bring in even more customers. Once someone has purchased from a company, they’re more likely to buy from that company again— especially with B2B purchases, which tend to be more complex sales and thus more carefully considered. Studies show that upselling and cross-selling can contribute to 4% or more of total sales. Are you taking advantage of these opportunities? If someone buys one of your products, are you recommending a complimentary offering or an additional add-on feature? Even if you have a full account management team responsible for capitalizing on upsell opportunities, there’s always room to grow. Marketing automation software can ensure that every account receives personalized and timely upsell offers from their customer service or account representative – even if it’s really coming from your marketing department. The amount of revenue you generate from any particular customer is limited based on the number of offerings you have to give them and your price point. But when you consider that the same customer can refer their friends and colleagues to your business and help you generate countless new leads, they suddenly become a lot more valuable. Marketing automation programs can help you build landing pages and email reminders so that your current customers can easily refer people to your business. You can even use social sharing technology – such as Facebook Connect or LinkedIn sharing- through your email and marketing automation campaigns to allow customers to easily connect you with their social graph and share your marketing materials. Ultimately, you probably want to retain your current customers and have them make as many repeat purchases as possible. Whether they sign a contract for a several year term or simply make a one-time transaction- you still want them to keep coming back and spending more, right? Right. Much like marketing automation can help you with upselling and cross-selling, it can also help you retain current customers. For example, when it’s a couple months before that contract term is set to expire, what if you could automate an email that offered the customer a discount for next year if they renew their contract immediately? Or what if you could send customers an automated message (maybe even a promotional offer) on their birthday, the day their company was founded, or the one year anniversary of them becoming your customer? Little gestures like these can ensure that your customers won’t just be your customers for the time being, but that they’ll stick with you for the long haul. So if you’ve already bought marketing automation software, it’s time to get to work, and start nurturing your customers! If you haven’t bought marketing automation software yet, hopefully you’ve discovered five more reasons you should. And the next time you talk to a marketing automation software provider, you can ask them “What will this system do for my customer-to-revenue performance management?” and see what they have to say. Katie Hollar is the Marketing Manager at Capterra, a free service that helps people find and compare business software. She's contributes regularly to Capterra's blog, where she blogs about B2B marketing and enterprise software. Katie specializes in marketing automation software. She also recently purchased marketing automation for Capterra and chronicled the process at MarketingAutomationDiary.com.